Ever since the Gone Girl movie blew up a few years ago, Gillian Flynn has become a household name and her books have been carried over to screen (Dark Places was turned into a movie). Next in line is Sharp Objects. It’s been turned into a mini series on HBO starring Amy Adams. I read the book a few years ago and I figured it’ll be good to share my thoughts, in case anyone was thinking of reading before its debut on July 8. Sharp Objects tells the story of Camille Preaker, a crime reporter who has been assigned a job to go back to her small hometown and write about the murder of two young girls. Going back home means facing the demons she has not quite put to bed seeing as Camille has just been released from a psychiatric hospital. She has to deal with her mother who she does not have a good relationship with, her step sister who she barely knows and dredge up old (not so great memories) while still being professional. 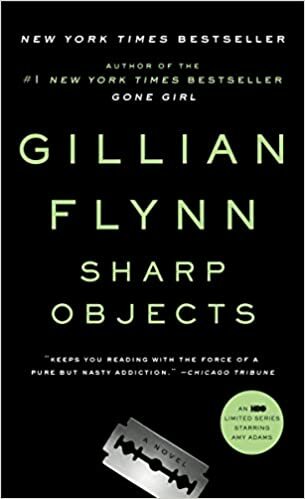 I have not liked any of her other books like I did Gone Girl but if you know anything about Gillian Flynn, then you know that the common theme in her books are that they go to some really dark, twisty places. I truly often wonder where her ideas come from as they are so gory! Don’t ignore the razor blade on the book cover as it is an indicator of Camille’s issue with self cutting and pretty much tells you the tone of the book. It is not an easy book because it deals with some intense topics that some might actually find triggering. I am not sure there are any redeeming characters in this book save for maybe Camille’s father figure boss, except he is a minor character. Every character is rather grating and you just want to roll your eyes every time they do something. For a whodunnit book, you get to have an idea who did it towards the end and even though I did not guess correctly who did it, I don’t think it will be difficult for some to figure out who did it but the twist might be a surprise. Overall, there are many reasons to read this book – Flynn is a good writer, get a head start on the miniseries, challenge yourself to read a book that doesn’t go down easy and because Taynement says it’s worth a shot. Let me know if you do read it or if you have read it. Would love to hear your thoughts.